OneRoster® is an Industry Standard format for exchange of Student Information System (SIS) data, and the OneRoster® REST APIs are the means by which we can sync objects from Student Information Systems that provide OneRoster® APIs to O365 through the School Data Sync (SDS) service. 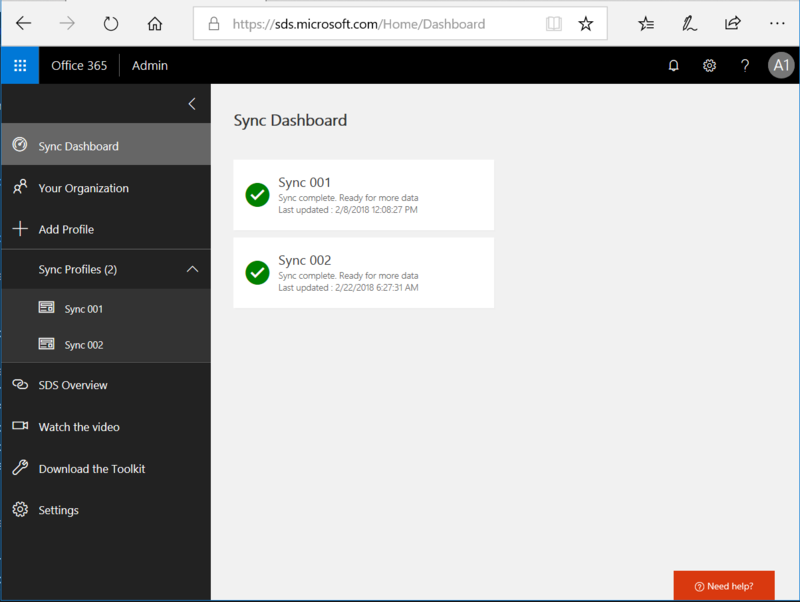 Using this sync method, you can connect directly to your SIS using the REST-based OneRoster 1.1 APIs provided by the SIS, and synchronize data directly instead of using CSV files. To set up SDS using the OneRoster® Sync method, follow the instructions detailed in this article. To access the School Data Sync Admin Portal launch a private web browser, navigate to sds.microsoft.com, and then sign in using your O365 Global Admin account. On the Choose Connection Type page, choice OneRoster API and then choose your SIS integration provider from the “Choose your provider” drop-down menu. Once complete, click Start. Choose your sync method - Choose between the available sync methods shown. 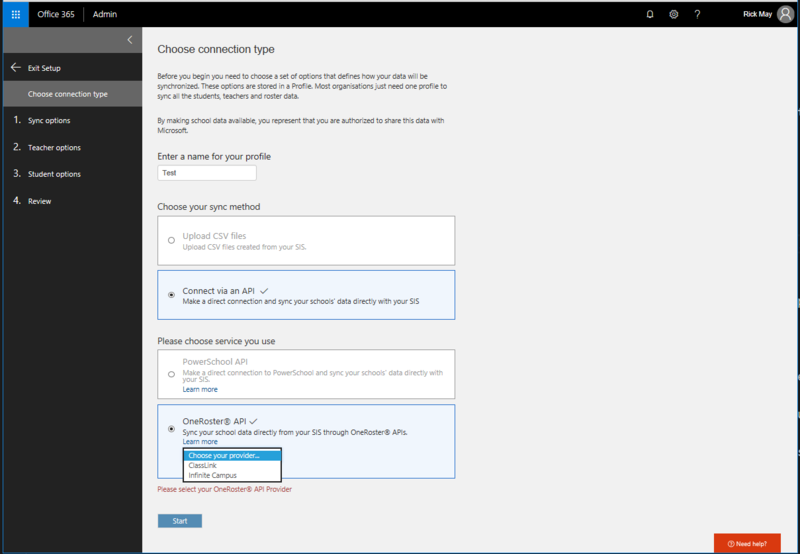 If you're syncing using OneRoster, select Connect via an API sync method, and then select OneRoster 1.1 API for the service selection. 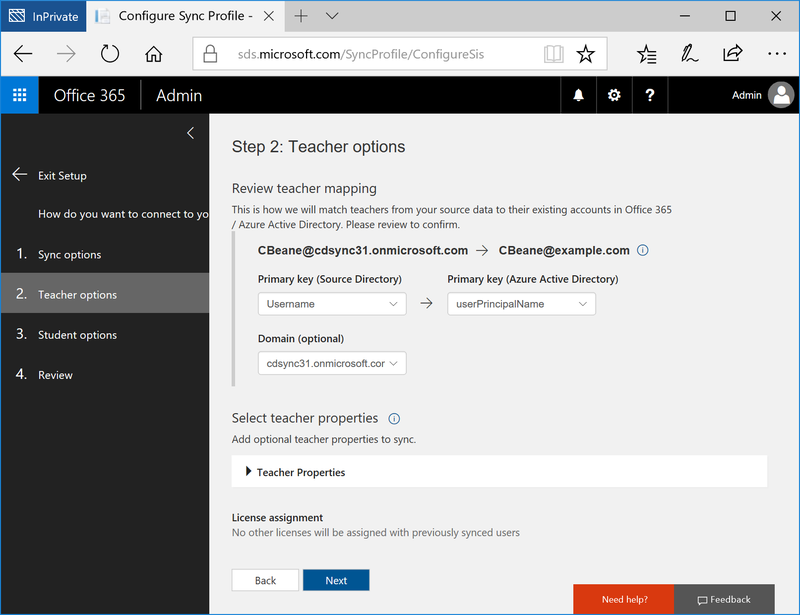 Existing Users - Select this option if you already have user accounts create within your O365 tenant for each of the students and teachers contained within OneRoster. New Users - Select this option if you want SDS to create user accounts for each of your students and teachers contained within OneRoster. Web Access URL - This is the internet accessible URL for the OneRoster Endpoint of your SIS. client Id - This is the OAuth consumer key for authenticating with the OneRoster endpoint of your SIS. client secret - This is the OAuth consumer secret for authenticating with the OneRoster endpoint of your SIS. When does your school year end? - Select the end year of the school year that you want to sync. For example, if you would like to sync 2017-2018 school year, select “2018”. By default, this syncs all the terms in the selected school year. After the profile is created, you can edit the sync profile to select a subset of terms to sync. School properties - These are the school attributes contained within OneRoster that SDS can sync. 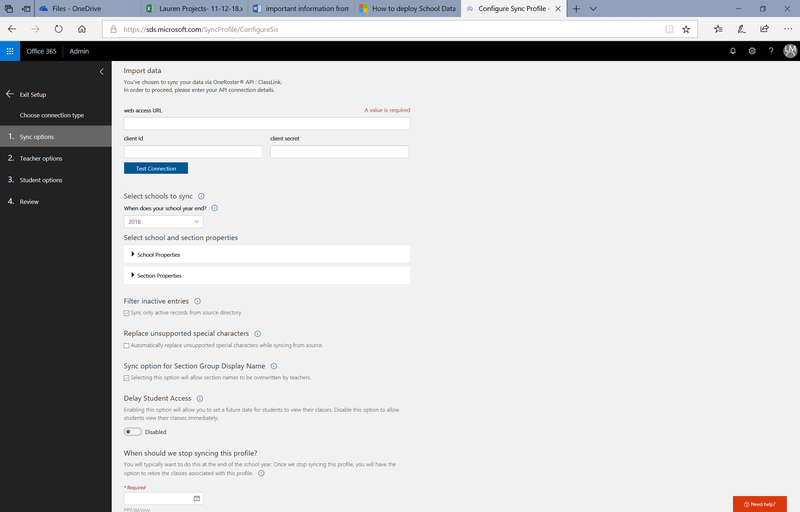 The greyed out attributes are the required attributes, and must be present in OneRoster for each school to sync. The additional attributes shown are optional, and can be synced if you choose. Section Properties - These are the section attributes contained within OneRoster that SDS can sync. The greyed out attributes are the required attributes, and must be present in OneRoster for each section to sync. The additional attributes shown are optional, and can be synced if you choose. Filter inactive entries - Sync only active records from source directory. 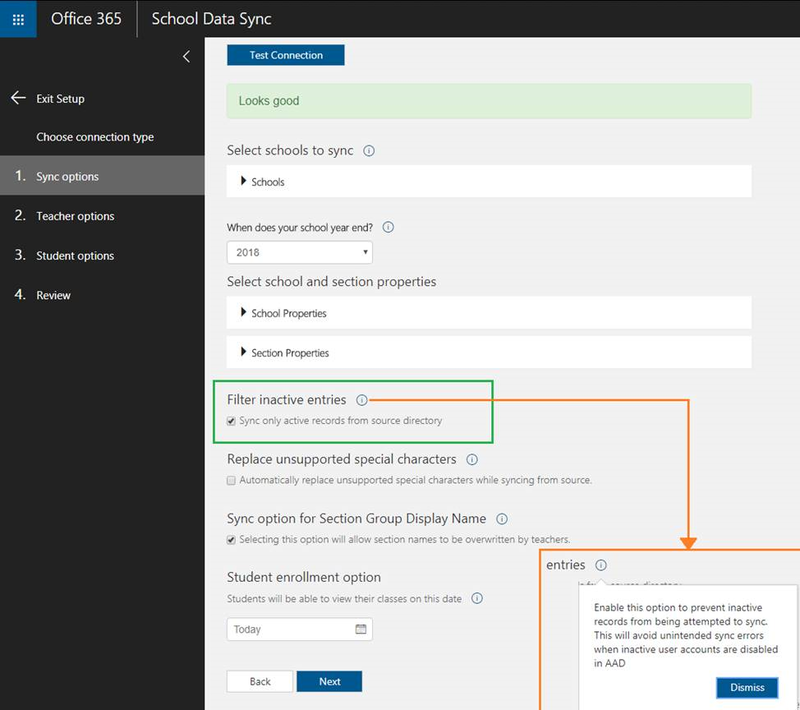 Replace unsupported Special Characters – Checking this box will allow SDS to automatically replace unsupported special characters while the sync is running. Special characters will be replaced with an “_”, and no longer result in an error during the sync process for that object. Delay Student Access - Enabling this option will allow you to set a future date for students to view their classes. When should we stop syncing this profile? You will typically want to do this at the end of the school year. Once we stop syncing this profile, you will have the option to retire the classes associated with this profile. Primary Key (Source Directory) - This is the Teacher attribute in OneRoster used for SDS Identity Matching. Watch the Identity Matching video for additional information on how to select the appropriate source directory attribute, and properly configure the identity matching settings for teacher. Primary Key (Source Directory) - This is the Student attribute in OneRoster used for SDS Identity Matching. Watch the Identity Matching video for additional information on how to select the appropriate source directory attribute, and properly configure the identity matching settings for teacher. Teachers – SDS syncs some students based on school association and status. Classes - SDS syncs some classes based on school association, and staff type. Schools– SDS syncs some schools based on school association, and staff type.